Tired of being forced to invest all your hard earned retirement funds in the stock market? Want greater control over your retirement funds? A Self-Directed IRAcheckbook may be your answer. Here are some self directed IRA rules and FAQs we hear and see often. Why does the traditional IRA/401K process have to be so complicated? It doesn’t! Many different agencies and businesses have attached their interest to the process for control and profits. You can manage your IRA yourself much more simply! We can help you by explaining the self directed IRA rules as we facilitate the process. Shouldn’t I “Dollar Cost Average”? Investment decisions are on a case-by-case basis and have to be made in context. Statistics show that many retirement investments are sitting stagnate for years and years without any changes to the direction of the investments. Why? By virtue of “dollar cost averaging” the public has been convinced to ride it out for three to five years. How’s that working out for you? The process of moving retirement investments, called a “rolling over,” is time-consuming and cumbersome because you have to employ others to handle your money. Most taxpayers avoid the hassles by doing nothing. Times have changed. Doing nothing equates to just that; Doing the same thing and expecting different results will not work. You must take control. Learn the self directed IRA rules and prohibited transactions from us today. Using an IRAcheckbook to buy real estate or make other investments has a number of advantages, including tax-deferral, diversification, and protection against a falling U.S. dollar. An IRAcheckbook is generally the investment vehicle of choice if one intends to exercise the opportunity to buy real estate with retirement funds. In this situation, a limited liability company (LLC) is established, typically in the state where the investment will be made. The IRAcheckbook, in care of the IRA custodian, will own the LLC. 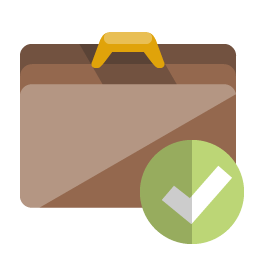 The IRAcheckbook holder (you) or any third-party can serve as the manager of the LLC and be compliant with the self directed IRA rules. Once the retirement funds have been transferred to a new IRA custodian who allows for real estate investments, the IRA custodian will then transfer the IRA funds directly to the new IRAcheckbook LLC bank account, tax-free. The new IRAcheckbook LLC bank account can be opened at any local bank or credit union. As manager of the IRAcheckbook LLC, you will have checkbook control over the IRA funds, allowing you to make a real estate investment (or other acceptable non-traditional investment) by simply writing a check directly on your IRAcheckbook LLC bank account. Once the real estate or other investment is made, all income and gains would generally flow back to the IRAcheckbook tax-free. 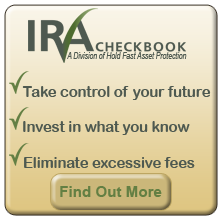 All investment expenses associated with the IRAcheckbook investment must be paid using IRA funds. 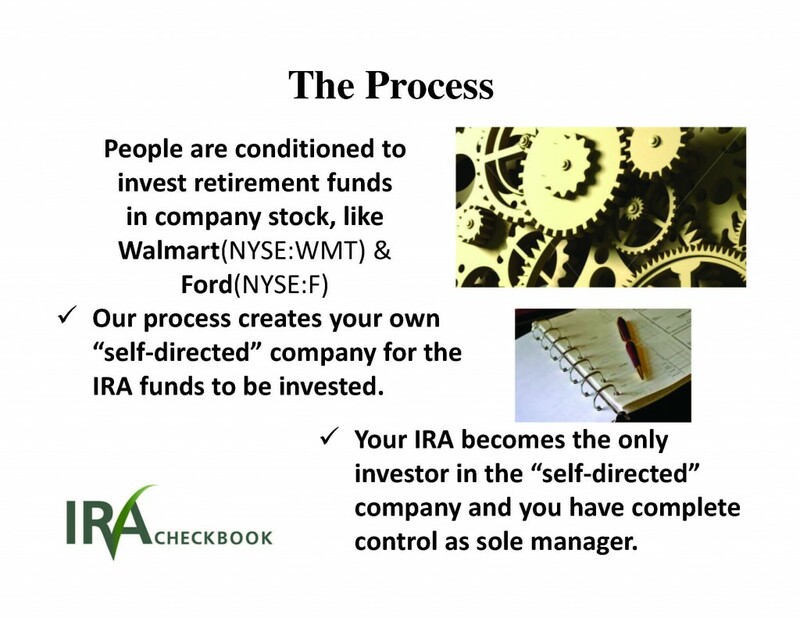 We know all the self directed IRA rules and will guide you every step of creation. 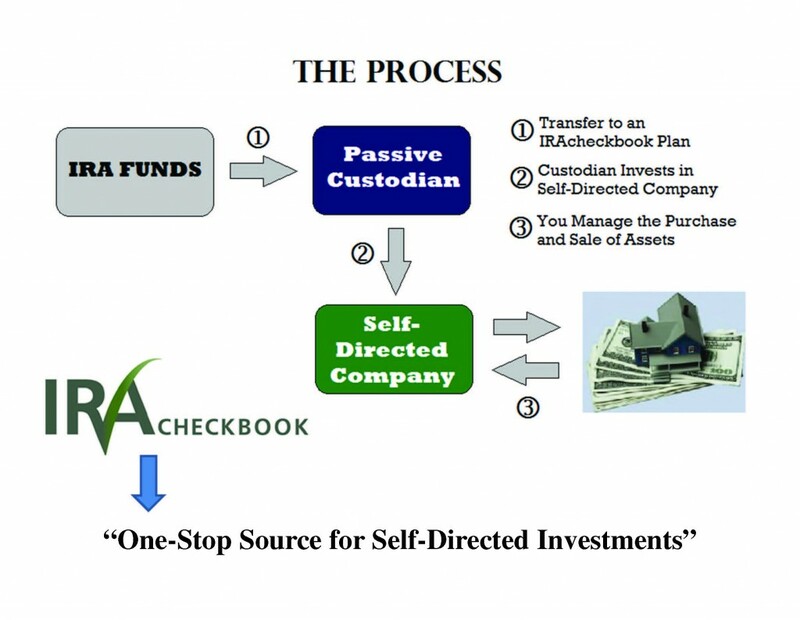 Why hasn’t my Financial Advisor /Attorney/ CPA heard of a Self-Directed IRAcheckbook LLC? Wall Street has a big megaphone, and until recently has been a safe investment. Your tax or financial advisor may not have heard of Self Directed IRAcheckbook LLCs because the traditional financial institutions prefer to focus on selling the more profitable (for them) equities, bonds, and mutual funds. The demand for self-directed investment rises with stock market uncertainty; couple that with a depressed real estate market and there is a real opportunity to affect retirement fund growth. The IRAcheckbook is self-directed. Is “self-direction” new to IRAs? Not at all. In 1974, the U.S. Congress created the Individual Retirement Agreements as a tax-deferred retirement vehicle. Its purpose was to encourage Americans to save for retirement. These original IRAs were intended to be self-directed, with the taxpayer allowed to make investments directly into real estate, businesses, intellectual property and other types of investments in addition to the more traditional stocks, bonds and mutual funds. In practice, however, the banks and brokerage houses that originally offered the IRAs were set up to only handle stocks, bonds and mutual funds. As a result, over the years people were left with the misconception – and the practice – of investing only in these types of securities. Times have changed. More and more Americans are demanding choices, especially when it comes to how their retirement money is being managed and invested. This is why “alternative investments” play such a large part in The IRA Checkbook. 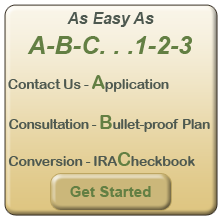 How does IRA Checkbook differ from my regular IRA? The IRAcheckbook’s two main benefits are self-directed investing and checkbook convenience, which enable you to invest in what you want, when you want. These benefits are not possible in a regular IRA. In addition, the Custodial fees are small, flat, and unrelated to the value of your assets (no percentage fees). Which alternative investments are available for my IRAcheckbook funds within the self directed IRA rules? How long does it typically take to set up the Self-Directed IRAcheckbook LLC structure? It generally takes anywhere from 7-21 days to set up the Self-Directed IRAcheckbook LLC structure. In most cases, we are able to complete the legal aspects of the transaction within a few days; however, the transfer of funds from one custodian to another can take some time depending on the financial institution and the type of assets being transferred. How old do you have to be to have an IRAcheckbook? Any American citizen, of any age, who earns an income can open an IRAcheckbook. Do you offer a Roth version of IRAcheckbook? Does the self directed IRA rules still let me invest in stocks, bonds, and mutual funds? Can my IRAcheckbook invest in anything I want? No IRA, of any type, is allowed to purchase collectibles (art, stamps, baseball cards, etc. ), or life-insurance contracts. All other investments, alternative and traditional, are allowed. In addition, no IRA can invest, or do business with a “disqualified person.” Such activities are known as “prohibited transactions.” These are against self directed IRA rules. You are a “disqualified person,” as are your spouse, parents and grandparents, children and grandchildren (and their spouses), your investment advisors, and any persons who provide any service to your IRAcheckbook. The logic is this: IRAcheckbook’s sole purpose is to provide you – at retirement – with enough money to live in a manner consistent with your wishes. Because the U.S. government allows you to invest tax-deferred funds into your IRAcheckbook, those funds cannot be used – prior to your retirement – to directly benefit you or any person who is closely related to you. Can I use my Self-Directed IRAcheckbook LLC to make loans to a sibling? Yes. According to IRC 4975, siblings are not included in the definition of disqualified persons. Thus, a loan to a sibling would not be a prohibited transaction. What are a few examples of “prohibited transactions”? Your IRAcheckbook cannot purchase property you own personally, or property owned by any member of your immediate family. Your IRAcheckbook cannot purchase property from any of your investment advisors, or any persons who provide any service to your IRA plan. You cannot personally guarantee a loan for a real estate purchase being made by your IRAcheckbook. Your IRAcheckbook cannot lend money to a disqualified person. Your IRAcheckbook cannot do business with any entity in which a disqualified person owns 50% (or more). What are the penalties if I engage in a “prohibited transaction” or a “disqualified transaction”? Your investment may be disallowed under Internal Revenue Code Section 408 or result in a “Prohibited Transaction” under Internal Revenue Code Section 4975 and could result in the immediate disqualification of your IRA. For the IRA owner, the IRA is deemed immediately disqualified as of January 1 of the year in which the prohibited transaction occurred (an extremely severe tax consequence), resulting in current income tax treatment of a traditional IRA and possible excise tax penalty for a premature withdrawal from an IRA. If this deemed “distribution” occurs, it will be subject to ordinary income tax and, if you were under the age of 59 1/2 at that time, a ten (10%) percent excise tax on premature distributions may also be assessed. For the Disqualified Person involved in the transaction, the initial tax on a prohibited transaction is 15 percent of the amount involved for every year (or portion thereof) in the “taxable period,” which is the period beginning when the transaction occurs and ending on the date of the earliest of (1) the mailing of a notice of deficiency for the tax, (2) assessment of the tax, or (3) correction of the transaction. The 15% excise tax is followed by an additional tax of 100% if the disqualified person is recalcitrant. Prohibited transactions outside the self directed IRA rules are extremely broad. Thus, the IRAcheckbook owner self-directing his investments must be especially cautious in engaging in transactions that could compromise his best judgment or result in indirectly benefiting him. But with the right guidance to follow strictly the self directed IRA rule you can reap the benefits with the piece of mind that you are safe. SEPs can be established by any type of business entity, including a sole proprietorship and independent contractors. SEPs are a great opportunity for the self-employed. Known as a SEP or SEP IRA, a Simplified Employee Plan is a retirement plan established by an employer, a sole proprietor, or an independent contractor. A SEP permits the self-employed or employers to make deductible contributions. These contributions are made to a Traditional IRA. Contributions to a SEP in any given year can be made up to 25% of earned income (with certain dollar limits). What is a Self-Directed SEP IRA? You can transfer all or part of your account to a self-directed SEP IRA. This combines the higher contribution benefit of the SEP with individual control. With a self-directed retirement account – you decide how to invest. When should a Self-Directed SEP IRA be considered? If You Are Self Employed as an independent contractor or sole proprietor, or are part of a partnership, C-corp or S-corp. If You Want Greater Investment Choices and you are unsatisfied with the returns offered by your current retirement account. With a self directed SEP IRA, you won’t be restricted to mainstream investments like mutual funds, stocks and bonds. You can have a wider choice of investment options including real estate, mortgages, tax liens, notes, precious metals and more. If Your Business Income Fluctuates and you don’t want to be locked into making contributions annually to an employer-sponsored plan. Low administrative costs and easy set-up are two major advantages of an SEP over other qualified plans. If You Want To Reduce The Tax Withheld From Your Paycheck. Contributions to your SEP account are not subject to FICA or other tax withholdings (does not apply to self-employed individuals). If You Want Tax Benefits. All SEP contributions are deductible for employers. If You Want To Shelter Interest Earnings. 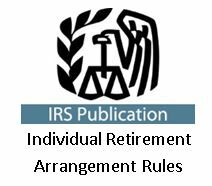 Interest earned in an IRA is not taxed until withdrawn (generally upon retirement). Click here to see an IRA comparison table. How does the process work in compliance with self directed IRA rules ?